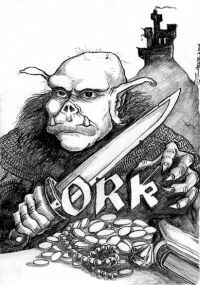 Ork is a play-by-email-game (pbem). Every player represents the leader of an orc tribe. Aim of the game is to become the High King of the Black Empire. And of course Orcs are not squeamish about the means to achieve this goal. The game master needs the Ork program. The players need the rules and access to the internet. About 20 players participate in a game, complemented by about 20 to 30 bit-orcs (tribes led by the computer). In "Scenario" you find some background information, especially about orcs. The more technical aspects are covered in ""For players"". Game masters should look up ""For game masters"" every now and then, especially to find new updates for the Ork program. 07. 12. 2005: Registrations for games are not possible at this time.